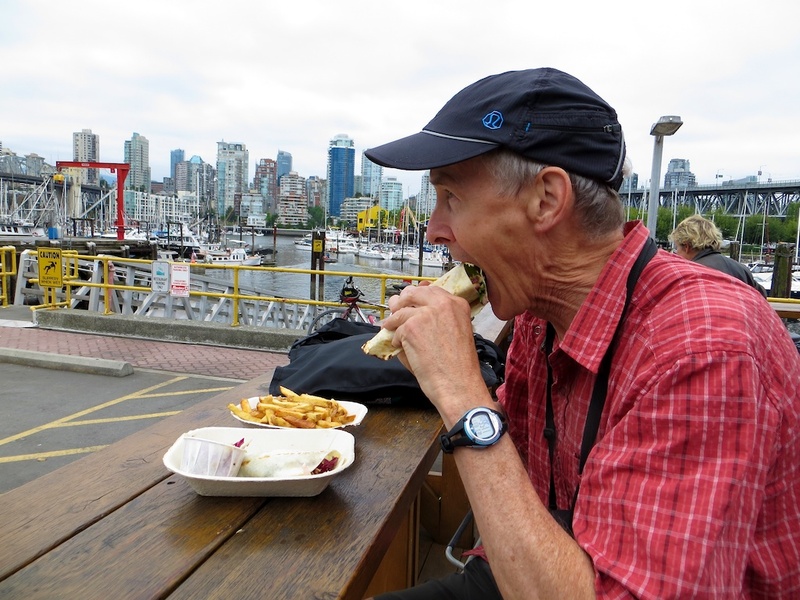 Marathon Mouth chomps down on salmon tacone at Go Fish, Vancouver B.C. It’s a bit late, but I realize I overlooked a number of categories in my Best Road Trip Meals of 2012 awards and figured I didn’t want to wait perhaps months to post reviews of some stellar places. So here we go with Part Two. Don’t take it from me. The traveling salesman sitting next to me at Biga Pizza says it’s the best pizza he’s ever tasted. It all starts, as it must, with great dough. Here, it’s a sourdough starter known as biga (bee-ga). They then add fresh, largely local and ingenious ingredients like fig paste and toasted hazelnuts and slide it all into a 650 F. brick oven for about eight minutes. The result is a bubbly, lightly charred crust with a lovely chewy texture and ingredients you can actually taste, i.e. they’re not drowned out by a heavy sauce or greasy cheese. 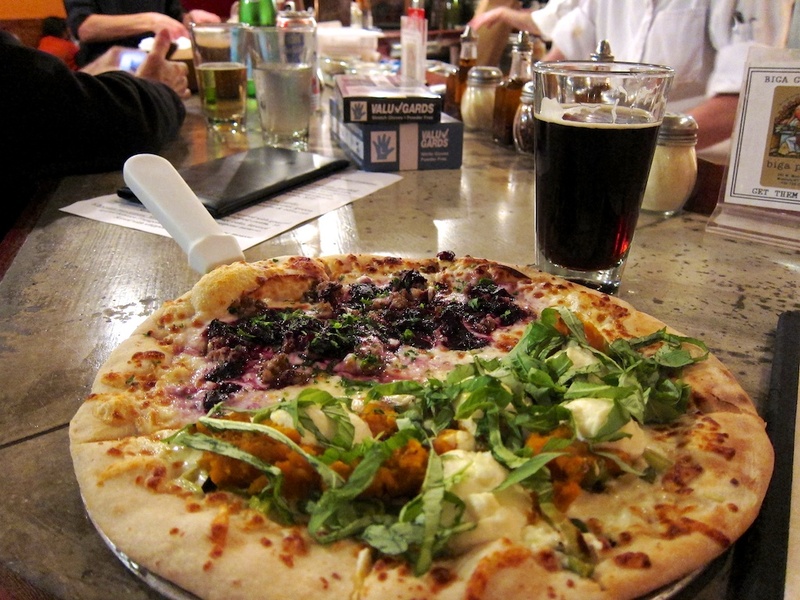 I get a half and half—one side their award-winning sausage, cherry chutney and smoked Gouda (my favourite of the two), the other a medley of local squash and pumpkin, which doesn’t meld quite as well. I wash it down with a pungent Missoula-produced Kettlehouse Cold Smoke Scotch ale, which because of arcane state laws on microbrewery production limits is for now pretty much available only in town. If you walk up to Pinche Tacos in mid-afternoon and encounter a lineup, like I do, do not turn around. Grab a seat at the shoulder-to-shoulder counter or wait, within reason, for a table. 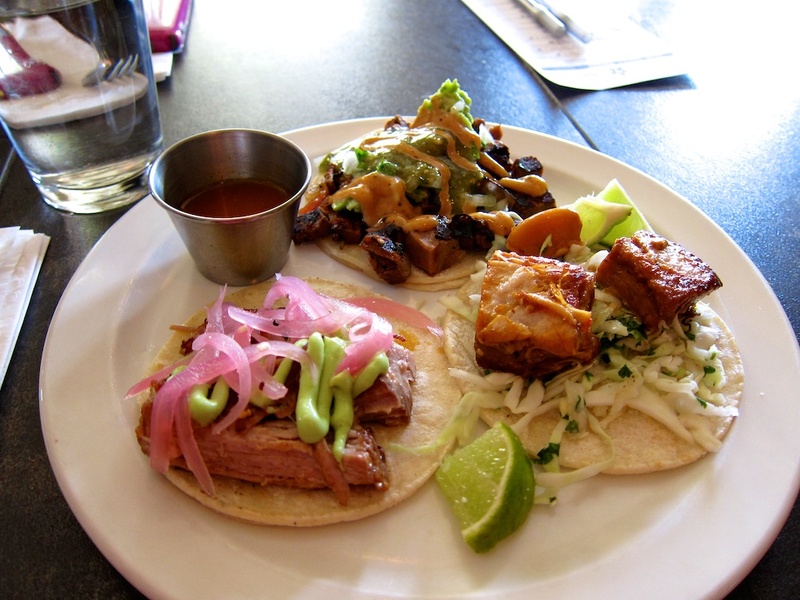 The payoff for me is the best tacos I’ve ever had—little pockets of heaven, no less. If, at gunpoint, I had to pick my favourite of the three I order, it would be the delectably soft sweet-and-sour pork belly with candied garlic, cabbage and cilantro sauce. The crispy roasted pork and the triple-cooked beef tongue (seriously) aren’t far behind. Really, you can’t go wrong ordering any of the dozen tacos on the menu, ranging in price from $2.95 to $4.50, a bargain for this quality of food. The cozy cafe also has an extensive list of tequila drinks. Even better than the food is the conversations I have at the grab-a-seat counter, because I’m sitting right next to and across from friendly strangers. The first guy, a regular, helps me make my choices. The customers who replace him actually supply the restaurant with its fabulous, just-made corn chips. They, in turn, introduce me to Pinche Tacos owner Kevin Morrison, who started the business as a food truck before adding this sit-down place. Soon, a couple of complimentary plates appear, one a fried chicken-skin appetizer, the other churros dipped in a warm, decadent Mexican chocolate sauce. These encounters, as much as the food, are the things you really remember on a long road food trip. Located in Canmore, at the eastern entrance to Banff National Park, Communitea is a buzzing local hangout for hooking up with friends in comfy couches while sipping good Intelligentsia coffee and French press pots of excellent loose tea or dining on stewed-apple compote or black bean and beet burgers. But the real standouts are the vegetable-packed lunch bowls and salads. 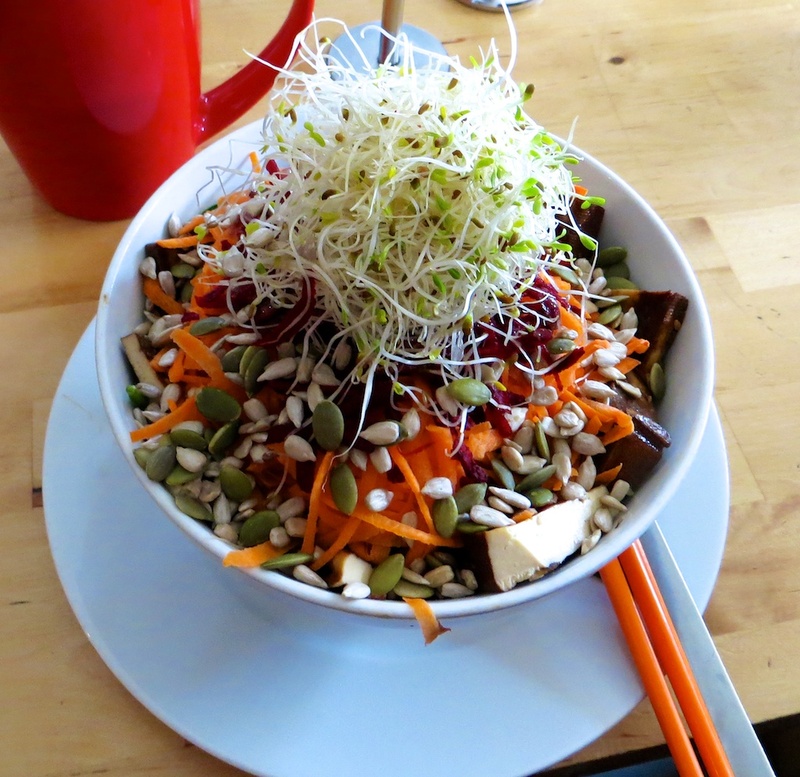 Take my Buddha Bowl, a volcano of marinated tofu, spinach and organic brown rice, tossed with tahini dressing and topped with shredded beets, carrots, sunflower and pumpkin seeds and an unruly hairpiece of sprouts. It takes me 15 minutes of excavating to get to the bottom of this explosion of flavour and crunchiness. You want healthy? How about the Jade Bowl, a vibrant mix of kale, broccoli, bok choy, spinach, quinoa, hemp and chia seeds, served with an orange ginger sesame soy sauce. Having eaten a lot of insipid salads across western North America, I can safely say it’s rare to see so many healthy, innovative and very tasty green bowls on one menu. Other restaurant owners should come here and take notes. Honourable Mention: Keg Lounge This award is for a fabulous berry salad in the strangest of places—a dingy bar in a Colorado resort town. 730 Manitou Avenue, Manitou Springs, Colorado. The Wildside Grill is touted as having perhaps the best salmon or lingcod fish and chips on B.C.’s west coast. Either choice lives up to its billing as bursting with fresh-caught flavour. But on a recent trip to Long Beach in Pacific Rim National Park, I can’t resist ordering a Cortez Island oyster burger. The “house-punched” fries are piping hot, and the generous helping of panko-crusted oysters is nicely crispy on the outside and gooey goodness on the inside. You take these dishes, or perhaps prawns and chips, to shaded tables outside the takeout window and tuck in. 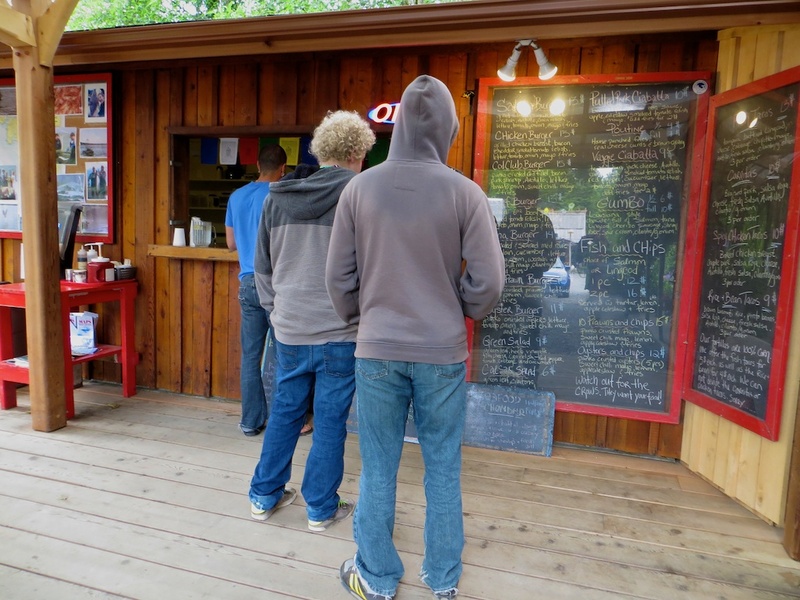 Lining up for killer fish and chips at Wildside Grill, Tofino B.C. 1180 Pacific Rim Highway, Tofino, B.C. Mile One has killer burgers, but I quickly switch gears when I see the menu features an astonishing six choices of macaroni and cheese. 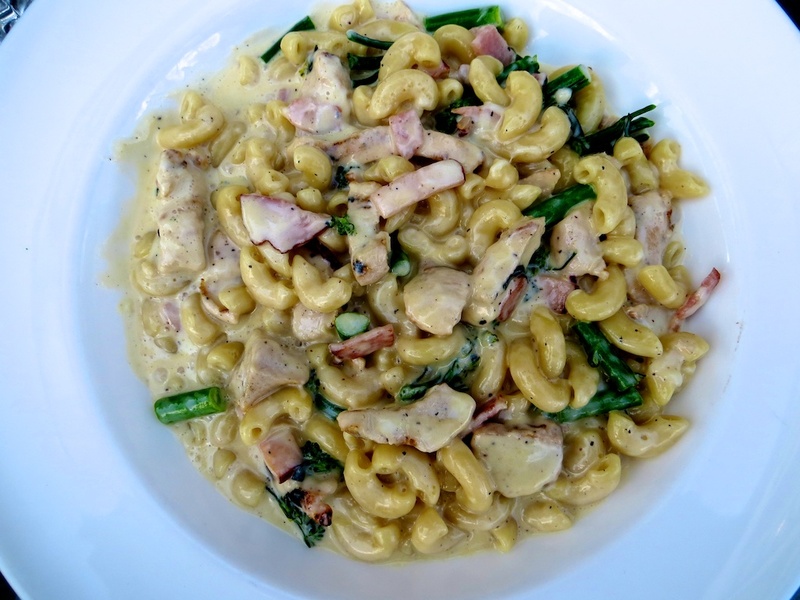 This includes my selection of Southern Comfort, a rich base of aged white cheddar and mozzarella, elbow pasta, grilled Fraser Valley chicken, broccolini and the killer kicker—smoked bacon. Oh, my Godness. I rarely eat mac and cheese, and I may never order it again. I’ve been ruined. Incredible mac ‘n cheese at Mile One Eating House, Pemberton, B.C. 7330 Arbutus Street, Pemberton, B.C. This entry was posted in Alberta, Best of 2012, Calgary, Denver, Edmonton, Food, Manitou Springs, Missoula, Pemberton, Restaurants, Road trip food, Tofino, Travel, Vancouver and tagged Calgary, Canmore, Denver, Edmonton, Food, Missoula, Pemberton, restaurants, Tofino, travel, Vancouver, Victoria on January 21, 2013 by bcorbett907. Reading while eating my lunch made me think a road trip is a good idea. Can I search by locations? If you click on Categories in the right margin, you can then click on all the cities, towns and states/provinces you’re interested in and all the posts that refer to those will come up. There will be more content under many of these geographic locations as I add more posts. Sorry, I forgot to mention you can also do various searches in the “Search” box at the top of any post. Great stuff Bill your photos really are awesome. Thanks for visiting Communitea in Canmore (and including us in your “best of 2012” list). Thanks, Marnie. Communitea is perhaps my favourite affordable eatery and coffee/tea place in Canmore/Banff. Just wish your hours were a little longer, but can’t blame you for wanting to spend more time in that beautiful mountain environment. 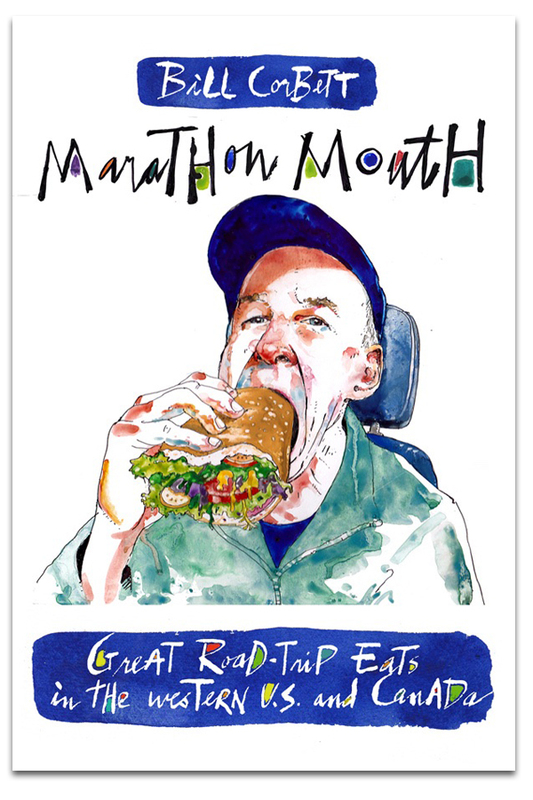 Like your blog and your road trip food finds. Just back from MedHat where it was a beautiful 20c in early April and no sign of snow. New annual food fest there called the Sunshine Skillet April 13/14 featuring amateur and pro chef competitions, local food fair. May be worth checking out. Thanks for the tip. I hope to make it to Medicine Hat later this year but am currently eating my way through New Mexico.